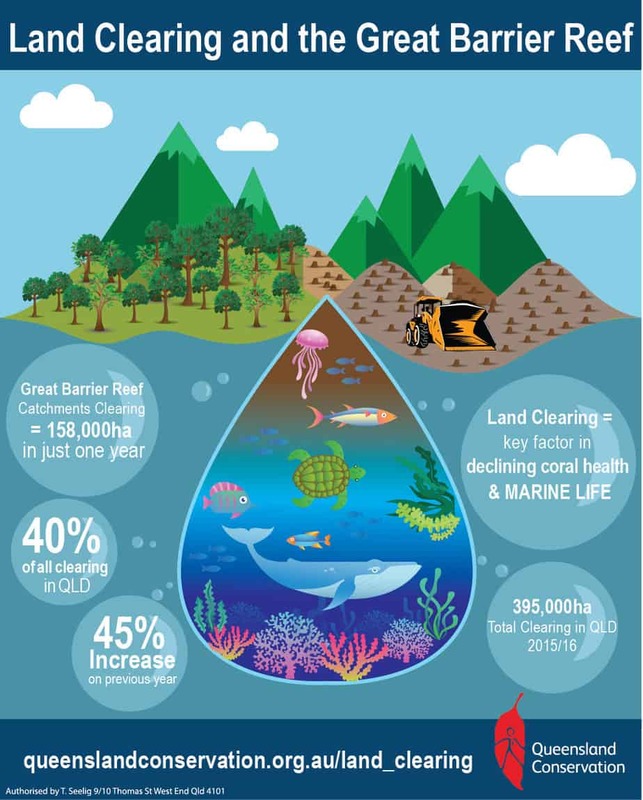 Approximately 40% of all clearing in Queensland in 2015/2016 occurred in Reef catchments. 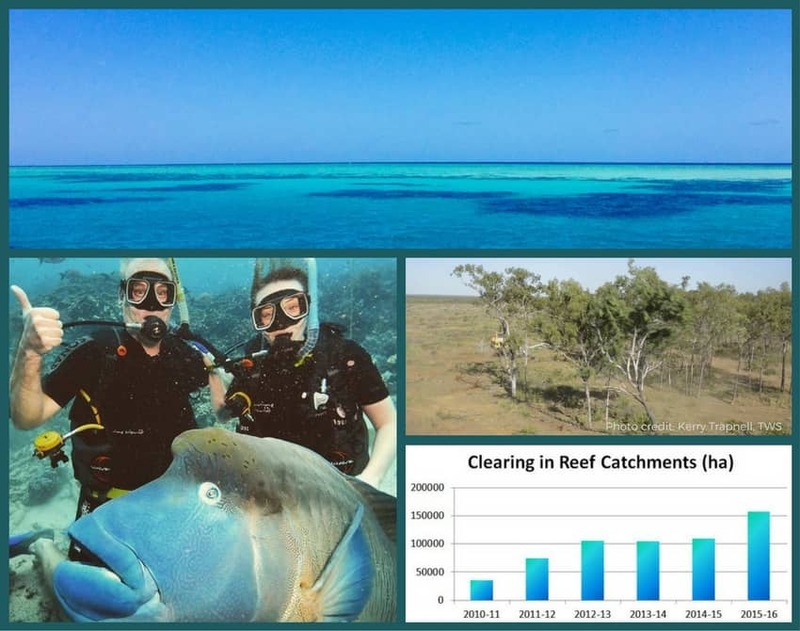 The Australian Government’s Reef 2050 Plan promised to address land clearing in the Reef catchments yet land clearing has increased almost 50 per cent in 2015-16 to 158,000 hectares. Stronger laws are needed to halt and reduce out-of-control, rapidly-rising land clearing rates in Queensland that contribute to the two biggest threats to the Great Barrier Reef – water quality and climate change. Right now, Queensland is in the midst of an environmental crisis from land clearing. Every second in Queensland, a tree is bulldozed and a native animal dies as a consequence of land clearing. But the consequences reach far beyond the clearing. Water quality and climate change are the two biggest threats to our reef and stronger laws to control land clearing are a necessary part of addressing both to increase the resilience of our reef. Land clearing in Great Barrier Reef catchments increases erosion and sediment and nutrient runoff flowing to the reef via reef catchment rivers and waterways. Already, approximately 10 million tonnes of sediment reaches the reef each year. To improve the outlook for our reef, we need to improve water quality flowing to the GBR, and not allow rising rates of land clearing to add to the already damaging and excessive sediment and nutrient burden on the reef. Land clearing in Queensland contributes tens of millions of tonnes of greenhouse gas emissions to the atmosphere every year. Land clearing contributes in two ways, firstly by releasing carbon stored in vegetation into the atmosphere and, secondly, by removing vegetation that would otherwise absorb carbon from the atmosphere. The risk of climate change to the reef has been made all too real by the unprecedented back-to-back coral bleachings in 2016/2017. There are many ways to reduce emissions. We need to not only do our bit but do our best. Allowing land clearing rates to skyrocket is not doing our best and is simply not right for the Reef. Land clearing is out of control – particularly in reef catchments. We cannot talk about reef resilience, water quality, climate risk or sustainable tourism without addressing the rapidly-rising rate of land clearing in Queensland and the implications for our nature-based tourism economy in FNQ. Stronger vegetation management laws won’t solve everything but are an essential foundation for safeguarding our wildlife, reducing emissions and protecting our reef. We are calling on decision-makers to recognise the far reaching environmental consequences of the out-of-control, rapidly-rising rate of land clearing and take immediate action by committing to and implementing ecological science-based law reform to reduce land clearing in Queensland. Add your voice to help us send the message to political leaders that regional QLD wants stronger land clearing laws. Stronger land clearing laws for our wildlife, our climate and our reef. What's your connection to the reef or issue? I support stronger land clearing laws for our wildlife, our climate and our reef. Land clearing is out of control – particularly in reef catchments. We simply cannot talk about reef resilience, water quality, climate risk or sustainable tourism without addressing the rapidly-rising rate of land clearing in Queensland and the implications for our nature-based tourism economy in FNQ. Stronger vegetation management laws won't solve everything but are an essential foundation for safeguarding our wildlife, reducing emissions and protecting our reef. I am calling on all decision-makers and political leaders to recognise the far reaching environmental consequences of the out-of-control, rapidly-rising rate of land clearing and take immediate action by committing to and implementing ecological science-based law reform to swiftly reduce land clearing in Queensland. Of course I want to hear more - please add me to your list. Spread the word – share this page on Facebook with a personal message asking your friends and family to support stronger clearing laws for our wildlife, our climate and our reef.